Nottingham Lakeside Arts has announced that it will show the first major exhibition of photographer Roger Mayne’s (1929 – 2014) work since 1999. The show will run from Saturday 30 September to Sunday 29 October 2017. 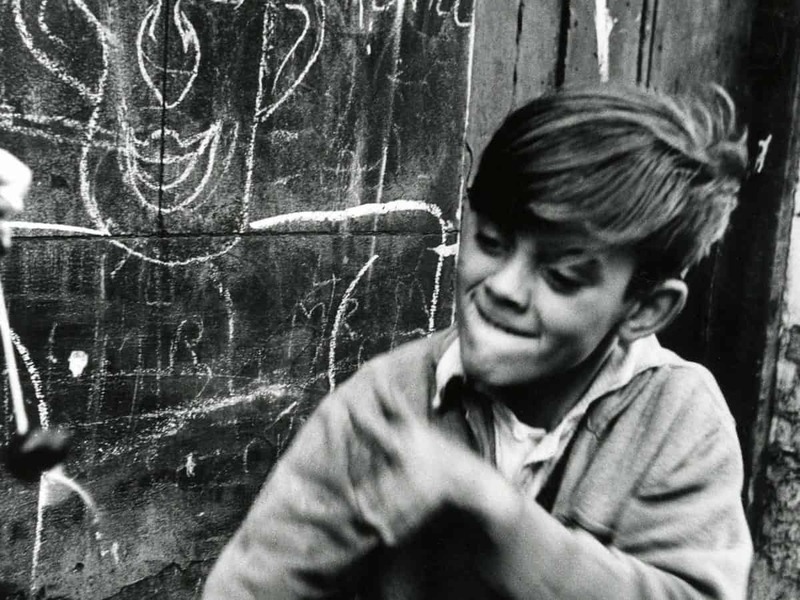 Roger Mayne is best known for his seminal and pioneering body of work on community life in London’s Southam Street in the 1950s and early 60s. Mayne’s humanistic approach to his subjects has influenced subsequent generations of photographers and made a significant contribution to post-war British photography. Self-taught, Mayne counted among his influences Cartier Bresson, Paul Strand (who he met in Paris) W. Eugene Smith and most notably photographer Hugo van Wadenoyen. Moving to London in 1954, Mayne began working for clients including the Observer, Sunday Times, Vogue, Pelican Books and BBC TV. He mixed with diverse artistic circles, corresponding and conversing with a wide range of painters, sculptors, architects, and playwrights. His approach to photography and engagement with the critical discourses of the day were greatly enlivened by these relationships. It was, however, his admiration for the St. Ives scene of Terry Frost, Roger Hilton and Patrick Heron that would have an enduring impact on his life and work, encouraging Mayne to experiment with large photographic prints, mounting methods and installation-based exhibitions at a time when there was little or no precedent for this within photography. These methods, alongside his considered and vocal debates on the topic helped to shift photography in Britain from a technical and commercial practice and position it within the wider arts. In addition to his depictions of Southam Street, the exhibition also features some of Mayne’s less well-known work from outside the capital. These include images from his young adulthood in Leeds (early 50s) where Mayne first developed his photographic interests. Between 1961-65, Mayne visited the newly developed estate of Park Hill in Sheffield for a variety of commissioned work. The modernist high-rises may seem far from the decay and haphazard life of Southam Street that had previously inspired him, nevertheless, his photographs of the residents conveyed similar empathy and nuanced observation of daily social interactions and children at play. In addition to his human subjects Mayne’s images were also concerned with the urban environment, capturing the sharp angles, shades and abstract forms of the buildings. At Raleigh Cycles in Nottingham in 1964, Mayne embraced the dynamic setting and low lighting of the factory to produce a series of dignified portraits of the workers in his distinctive black and white tonality. These portraits were commissioned as stills for Philip Donnellan’s documentary The Factory. Mayne’s reputation as a ‘street photographer’ commended him for another commission in Nottingham five years later. Photographing in St. Ann’s, an area of poor housing and social deprivation, he produced the front cover for Pelican’s ‘classic study’ Poverty: The Forgotten Englishman. Also restaged in the exhibition for the first time since 1964 is Mayne’s pioneering installation ‘The British at Leisure’. Commissioned by architect Theo Crosby for the Milan Triennale, it features 310 colour images projected on five screens to a jazz score by Johnny Scott. The exhibition is organised by The Photographers’ Gallery, London, and curated by Anna Douglas and Karen McQuaid in collaboration with Katkin Tremayne, Roger Mayne’s daughter.